MONTAGUE – The Montague football team’s offense has been firing on all cylinders since its loss to Reed City in Week 1. The Wildcats scored a combined 122 points in weeks 2 and 3 (an average of 61 points a game), while allowing just a single touchdown. 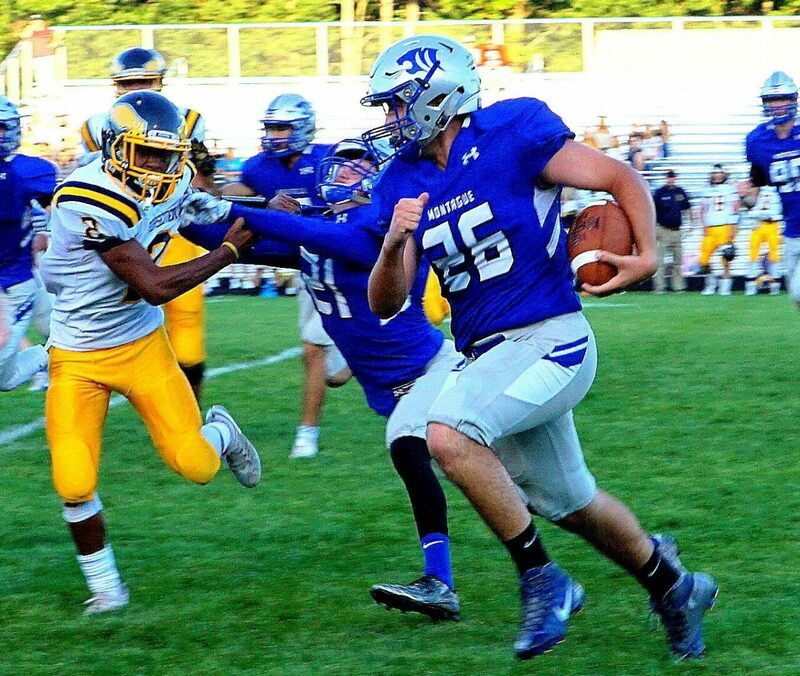 The offensive explosion continued on Friday as Montague won its third straight game, defeating North Muskegon 62-20 in West Michigan Conference action. The Wildcats are now 3-1 on the season and 3-0 in league play and will host Whitehall next Friday. Montague, which rushed for 332 yards as a team, was led by Bryce Stark with 165 yards on 26 carries and five touchdowns. 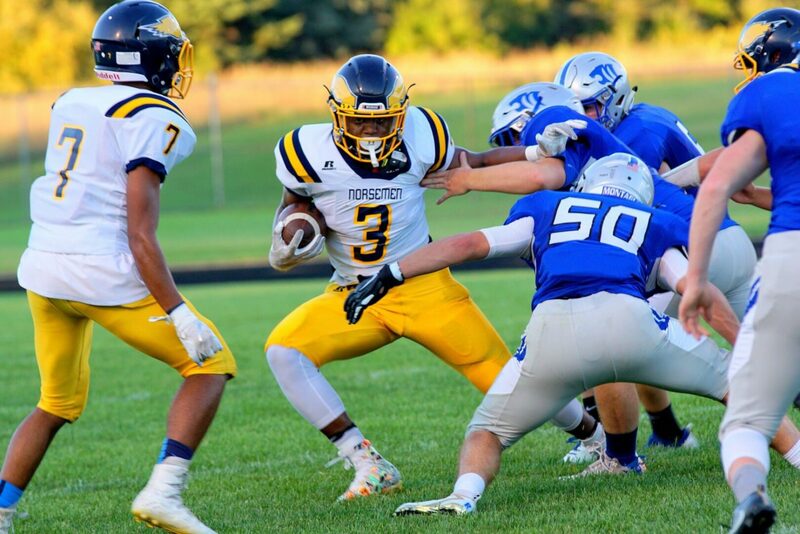 Johnny Monette added 122 yards rushing on eight carries and two touchdowns for the Wildcats, while quarterback Drew Collins had 40 yards on the ground on eight carries, with a score. Collins, who replaced starting quarterback Sebastian Archer last week after he suffered a shoulder injury, also threw for 60 yards on 6-for-10 passing. The Wildcats jumped out to a 19-0 lead with 1:31 left in the first quarter on two rushing touchdowns by Stark (3- and 26-yards out) and a 15-yard pick-six by Nick Stever. North Muskegon responded with 1:14 left in the opening stanza on a 94-yard kickoff return touchdown by TJ McKenzie. Montague led 19-6 after the first quarter. The Norse cut their deficit to 19-14 with 8:15 left in the second quarter on a 28-yard touchdown completion from quarterback Mack Young to McKenzie. Montague responded, then never looked back, with a six-yard touchdown run by Collins and a three-yard scamper by Stark. The Wildcats increased their lead to 41-14 on their first possession of the third quarter on a six-yard scoring run by Stark. North Muskegon’s Chandler Edwards caught 21-yard touchdown pass from Young with 7:43 left in the third. But Montague increased its advantage to 55-20 on a 68-yard touchdown run by Monette and a two-yard scamper from Stark. The Wildcats closed out the scoring with the lone touchdown of the fourth quarter on a nine-yard run by Stark. 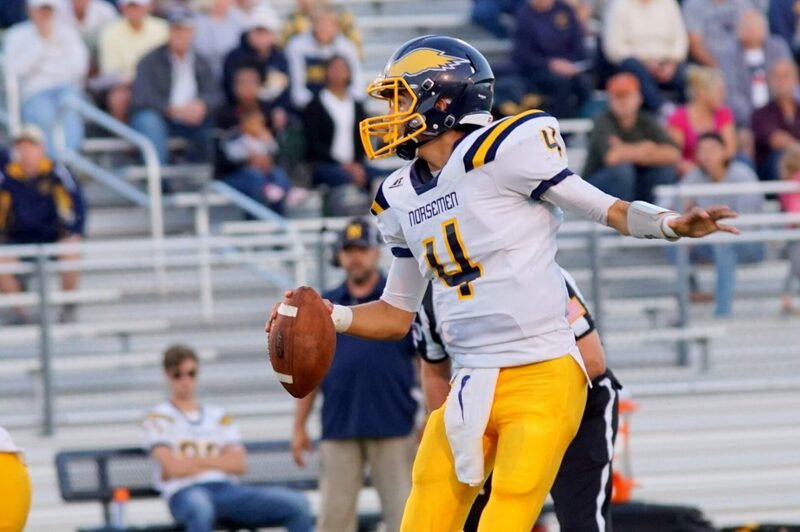 The Norse were led by Young, who threw for 144 yards on 14-for-23 passing and two touchdowns. Edwards led in receiving with four catches for 39 yards and a touchdown, while McKenzie added three receptions for 37 yards and a score. The Norse dropped to 1-3 on the season and 0-2 in conference play. They will now have to win the rest of their games to lock down a playoff spot, starting next Friday against Mason County Central.